Shopping: Head to the Branson Landing or Tanger Outlets for all of the many Labor Day weekend sales! 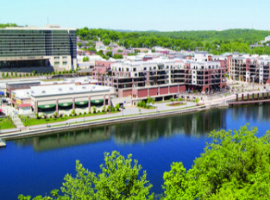 The Branson Landing features a variety of stores, restaurants, and activities. You’ll find popular stores such as Belk, Bass Pro, H&M and other specialty boutique shops. When you get hungry for lunch or dinner, try out Garfield’s, Famous Dave’s, Joe’s Crab Shack, or Black Oak Grill. There are also lots of places to find ice cream, pretzels, and cinnamon rolls along the way! Tanger Outlets features numerous stores that the entire family will love. You’ll find stores like American Eagle, White House Black Market, Disney, Nike, Under Armour, Kate Spade, and many others. Make sure to stop by guest services to get a coupon book before you begin your shopping spree! Lake Fun: Your Labor Day weekend isn’t complete without a trip to the lake! Rent a boat, go kayaking, or try parasailing above Table Rock Lake or Lake Taneycomo. Head to Moonshine Beach to relax, take in the sun, and swim! There are plenty of options to find the perfect way to enjoy the water! After all of the shopping and time spent on the lake, you’ll need a break! Unwind and head to one of the many shows offered! One special Labor Day show taking place is the Hughes Music Show! On Labor Day, the theatre is celebrating the achievements of the American worker. There’s even the option to add a delicious meal before the show! Another great option for entertainment is the Boogie Wonderland concert at the Branson Landing. Boogie Wonderland is a five-piece band that brings disco to the stage. Songs of The Bee Gees, Bruno Mars, Earth Wind and Fire, and many more will be featured. This special concert kicks off at 7pm on September 1 and is free to the public! After all of the festivities during the day, catch the stunning fireworks display at Chateau on the Lake. The fireworks will begin at 9pm on September 2. It's a great way to celebrate Labor Day weekend in Branson!